Virtual Reality currently seems to reach the plateau of productivity (Gartner Hype Cycle) and this technology could realy alter the entire tourism industry. We, at the department of Innovation and Management in Tourism, will focus on this technology and it´s challenges for the industry within the next months. A number of projects, Bachelor- and Master-Theses will complement our research activities. Please check out the article Paul Bulencea wrote on our Gamification-in-Tourism Blog on “How to use Virtual Reality in Tourism“. 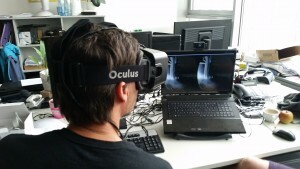 Roman Egger testing the Oculus Rift….